Following the mid-range E-M5 and high-end E-M1, Olympus introduced the E-M10 as the new entry-level model of the enthusiasts OM-D line. It shares a number of features from both the E-M1 and E-M5, such as a stabilized 16-Mpix MOS type sensor, EVF and touch-sensitive tilting rear LCD and introduces a few of its own over the mid-range E-M5 such as Wi-Fi and a built-in flash. Although the metal body resembles the pricier E-M5 with its twin control dials and angular lines, it lacks that model’s weatherproofing. That and the 3-axis (instead of 5-axis) stabilization are the only real concessions over the E-M5. As well as a 1/4000th sec shutter speed (with 1/200th sec sync) it can shoot a burst of 20 raw images at up to 8 fps, or 3.5 fps with continuous AF. For this round up on the E-M10, we’ve analyzed the optical performance of over 30 different native Micro Four Thirds models from both Olympus and Panasonic, as well as some models from third-party makers. We’ve examined a total of 18 zooms, including the new high-grade M. Zuiko Digital ED 12-40mm f2.8 Pro zoom from Olympus and 17 fixed focal length models, including the modestly priced trio of DN Art series lenses from Sigma and the new $1,600 Leica Nocticron 42.5mm f1.2 ASPH lens from Panasonic. 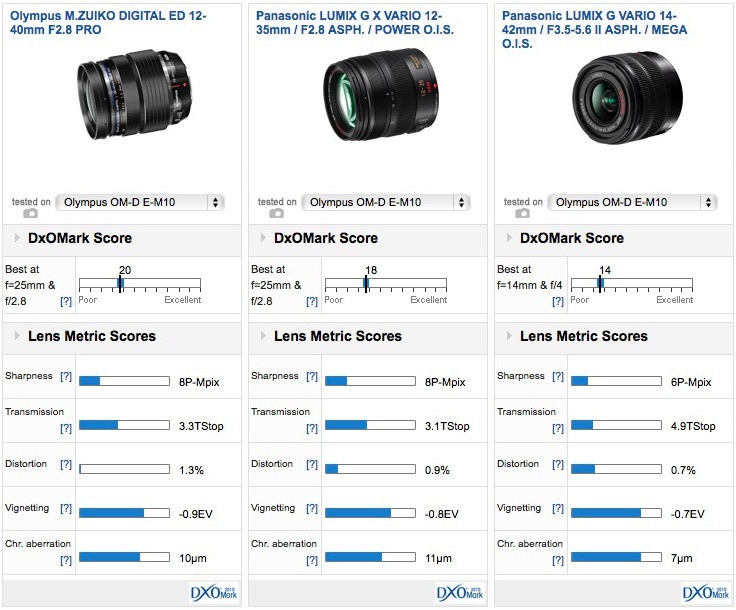 The best performing lens on the OM-D E-M10 is the new Panasonic Leica 42.5mm f1.2 ASPH which, unsurprisingly perhaps at $1,600, has ousted the M.Zuiko Digital 75mm f1.8 from the top spot with a DxOMark lens score of 27 points and a 11-P-Mpix sharpness score. Optically the two models are well matched but, being the equivalent to a 85mm on a full-frame camera, the shorter focal length 42.5mm is more suited to indoor portraits than the 75mm. 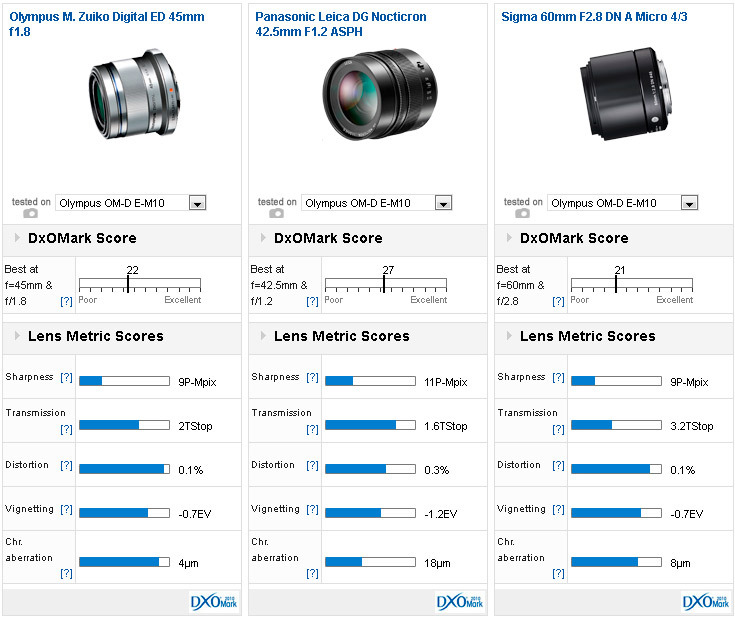 Ranked third for optical quality of those seen on the EM-10 is another Leica-designed model, the ultra-fast ‘normal’ Leica Summilux DG 25mm f1.4 with its distinctive look, high peak sharpness and an excellent overall DxOMark score of 24 points with a DxOMark score of 23 points. In fourth place is the popular Olympus M.Zuiko 45mm f1.8, and would make a modestly priced option to the Leica 42.5mm. Although there’s no guarantee lenses will perform to the same high standard on different bodies it’s still unsurprising to see the relatively new 12-40mm f2.8 Pro from Olympus as the best performing zoom model. This was launched alongside the E-M1 and it remains a great performer on the E-M10. In second place is the stabilized Panasonic 35-100mm (70-200mm equivalent), which has high peak sharpness, albeit without quite the same level of aberration correction. In third place is the Panasonic equivalent to the Olympus zoom (in first place), the stabilized 12-35mm f2.8. 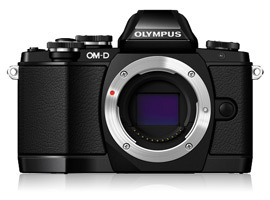 At $1,129 it’s a model with complex imaging characteristics like the Olympus, but overall it has great optical quality. Of the five models in this category in our database, two are duplicated by revised versions. The Panasonic 20mm f1.7 ASPH and the Sigma 30mm f2.8 EX DN have been superseded but we’ve included them, as they might still be available on retailer’s shelves. The top performing standard lens, the high-speed Leica branded Summilux 25mm f1.4 is pricey but has enjoyed the position without a rival (although we’ve yet to test the recently introduced Olympus 25mm f1.8 model). The 25mm f1.4 is an outstanding performer overall with a usable maximum aperture (albeit only sharp centrally) and excellent uniformity from f2.8 but it has rather high levels of chromatic aberration and distortion. The original Panasonic 20mm f1.7 was high regarded for its small size, high-speed and image rendering, but the new revised version isn’t quite a match optically for it in our tests. Nevertheless the differences between the two are slight in the lab and likely unnoticeable in real world use. At $400 it’s still not cheap exactly but the savings are significant and it’s much more compact and discrete model than the Summilux. The Sigma follows in third place but it can’t match either Panasonic model for sharpness – it performs well centrally, but even at mid-apertures sharpness is restricted to the centers. Olympus M.ZUIKO DIGITAL ED 12-40mm F2.8 PRO vs Panasonic LUMIX G X VARIO 12-35mm / F2.8 ASPH. / POWER O.I.S. vs Panasonic LUMIX G VARIO 14-42mm / F3.5-5.6 II ASPH. / MEGA O.I.S. Although the Olympus 12-40mm f2.8 and the Panasonic equivalent aren’t exactly accessibly priced Olympus are still targeting enthusiasts with the EM-10 and these high-grade zooms are tempting. Brand loyalty aside, the Olympus model is still the more sensible choice if only because it seems unnecessary to pay more for the stabilized Panasonic. 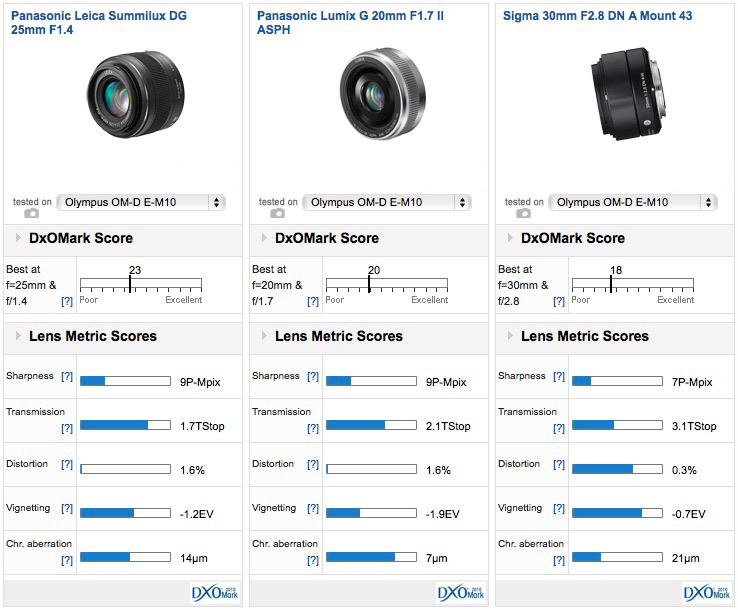 Still the two are comparable in optical quality, though in our tests the Olympus leads slightly, in the main due it’s superior sharpness at and close to full aperture at the wider focal lengths – though the Panasonic is sharper centrally at the longer end at maximum aperture. However, if they’re too heavy and expensive the Panasonic 14-42mm f3.5-5.6 II ASPH may be a tempting option, weighing just 3.88 oz (110g) and with a much more modest $245 price tag. It’s not particularly sharp at the longer end but at shorter focal lengths it’s a very good performer, at least centrally. If you want edge-to-edge sharpness (albeit when stopped down a little) either of the f2.8 zooms are the models to go for, but you do pay for the privilege. The best performing short telephoto lens we’ve tested is the stabilized Panasonic Leica 42.5mm f1.2. Although much more compact than the equivalent in 35mm format it’s still a large and relatively heavy lens on the E-M10. As you might expect this lens performs outstandingly well when stopped down to f4 but sharpness is limited to a central core at full aperture. On stopping down this lens’ sharpness gradually increases while expanding across the frame where, at f4, it’s sharp from corner-to-corner. Of course it’s just this characteristic (along with the field of view) that makes it attractive as a portrait lens, but bear in mind depth of field is still quite shallow even with this focal length. That said, at $1,600 it’s not going to appeal to everyone. Far more compact and much more modestly priced the 45mm f1.8 from Olympus is a rightly popular choice. It has a large maximum aperture for appealing defocussed backgrounds and like the Leica sharpness gradually increases on stopping down. It might not be to everyone’s tastes at full-aperture and it doesn’t have corner-to-corner sharpness but it’s a tempting option all the same. In third place by a narrow margin is the revamped Sigma 60mm f2.8 DN A. It has narrower field of view and a ‘slower’ f2.8 maximum aperture but it has good sharpness across the field a close 0.5m minimum focus distance and is both light in weight and relatively compact. If you have an Olympus OM-D EM-10 and a favorite lens, we would very much like to hear from you. Please leave a comment below, stating what lens it is and why you like it.